Lost Cities were prosperous, well-populated areas of human habitation to the Machu Pichu. Babylon, settled around 2500 BC, became a great centre of the Mesopotamian world 500 years later, when Hammurabi, the king of the Babylon empire, made it his capital. It was destroyed in the 6th century BC by the Assyrians, and then left to fall into ruin in the 2nd century BC, following the death of Alexander the Great. The ruins of Babylon conjure images of a biblical past: the tower of Babel; the beautiful hanging gardens...and there s that certain disco song that just won t leave your head. Founded by an ancient Indian King sometime around the 7th century BC, Taxila (or Takshashila) is a tale of three lost cities. The first was built on a hill, later known as Bhir Mound. In an Old Testament style confusion of begats and political intrigue, the city was lost to a new Taxila, known as Sirkap, built by Greek invaders. It enjoyed a period of significance in the world of philosophy and the arts, which continued under the Kushans, who took over and refounded Taxil as Sirsukh. Eventually, the city was lost to the Huns in the 6th century, who destroyed it and left it in ruins. Visit the site today, about 30km northwest of Islamabad. The Taxila Museum houses all manner of artifacts, which help you get a feel for the complex history of this once great city. Here was a town basking in glory, a major seaport and one of the largest cities in medieval Britain, said to have been the capital of East Anglia ?but all built on sand. In the late 13th century a storm blew in, demolishing a good part of the town. Coastal erosion chipped in and before you could say cursed city , only a few cottages remained. Tales of haunted beaches abound, and at low tide you might well hear the muted tolling of church bells beneath the waves. At the foot of the Chiapas mountains in southwestern Mexico, Palenque is an archaeologist s treasure trove. The city appears to have existed at least since 100 years BC. Five hundred years later it became a major population centre of Classic Mayan civilisation, complete with myth and legend: child kings, invasions, decapitations, court intrigue and finally the abandonment of the city. Crumbling stone temples in the python grip of jungle vines, a flash of turmeric colored robes disappearing into the alcoves of ancient temples. Angkor has its fair share of tourists, but its size means you ll easily find a place to get lost in the distant past. The great city was enormous, new research suggesting it covered 3000 sq km. 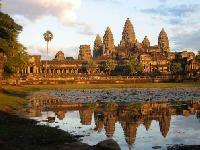 Built by a succession of Khmer god kings from AD 900 to 1200, it had a population close to one million, and was the capital of the Khmer empire. It s been suggested that climate change caused the city to be abandoned some 500 years ago. Way out west, in the desert dominated state of Western Australia, you ll find a town if not fully lost, so close to being a ghost as makes no difference. Officially no longer a town, and not receiving government services, this place supported an asbestos mining industry until the mid 1960s, when health concerns over the lung clogging stuff spelt its demise. To fully experience it, take a long drive north from the state s capital, Perth. A lonely drive to a lonely place! In the Sierra Nevada mountains east of Yosemite National Park, California s largest ghost town, Bodie, stands in an intentional state of arrested decay. As you walk down the empty main streets past the skeletal remains of banks, boarding houses and brothels, you might get the impression that the hurly burly gold miners and red light madams just packed up and caught the last stagecoach out yesterday. A national historic landmark, Bodie now harbors over 200 buildings and historic structures that could take you all day to explore. Like nearby Pompeii, Herculaneum was lost to a river of Vesuvian lava and ash in AD 79. An upper class town, home to members of the imperial family, it was uncovered about 250 years ago and remains a treasure trove for archaeologists. The pyroclastic flow that enveloped the city carbonised organic matter, preserving structures and human bodies. Most enticing, though, are the hundreds of scrolls found in the Valley of the Papyri, text from the only ancient library to have survived into modern times. It s never enough for a great city to be destroyed only once. After 900 years exerting power in North Africa and southern Europe, Carthage succumbed to the wrath of the Roman Empire (needled for so long by the elephant led armies of Hannibal). Later rebuilt by the Romans and raised to new glory, it once again found itself at the nexus of conflict and was destroyed by Arab Muslims expanding their own sphere of control. Today, on the outskirts of Tunis, you can visit the crumbling remains of Roman baths, temples, and villas being absorbed by the sprawl of the city.